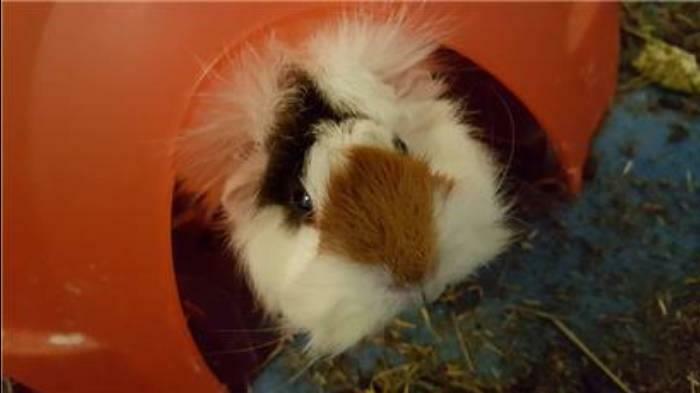 Home > Our Crazy-haired Abyssinian Guinea Pig "Fluffy Muffy"
Our Crazy-haired Abyssinian Guinea Pig "Fluffy Muffy"
We adore our little crazy-haired friend "Fluffy Muffy." She's simply a soft, cuddly puff of fluffy love! But, as we found out this past year, taking care of guinea pigs can be quite the messy business. Exactly one year ago next month, our eldest daughter decided she needed a guinea pig. Apparently, it was vital to her happiness. Kids! Well, being the ridiculously pet-loving parents that we are, my husband and I decided we should go for it. So, lo and behold, after a few visits to the local guinea pig rescue farm, we managed to come home with not only one, but two, guinea pigs. Initially, it was all about the love. They are so, so unbelievably adorable. And, I do have to say, perfect for children. However, coming from the mom of 3 kids, I do believe they are ideal mainly for kids over 5 years of age. Why? Well, at the time we adopted Muffy and her co-guinea pig our younger kids were 2-year-old twins. At that really young age it was very hard to teach them the importance of carefully holding such little creatures. In all truth, my girls were used to wrestling with our 120 lbs dog, so this new way of holding tiny, delicate creatures wasn't easy for them to process. Overall, I think kids of any age would love guinea pigs, but, kids younger than five, I believe, would need some careful supervision. Well, unfortunately, there's a bit more to taking care of Muffy and her piggy pal then just hugs and kisses (and more hugs). Honestly, even though I read several online articles and looked through countless books, I just did not foresee how much of a mess these little creatures make. At first, we opted for a DIY homemade C&C cage, and simply decided to use wood shavings for the bedding. While it does absorb a good amount of the smell, the shavings make a ridiculous mess. So, after several weeks of cursing quietly to myself when I would carry out their weekly cage cleanings, I decided I would use fleece cage liners instead. Even though it was a cleaner approach, it still proved to be a real pain to remove, wash, dry and reinstall. Another, different kind of pain. All in all, the guinea pig itself is just too cute for words. It is an extremely affectionate, constantly-chewing-everything fluffy ball of... fluff! It's like a tiny eating machine, injecting all things vegetable, fruit, and hay. Though they are always looking for something to nibble on (they need to constantly chew on things in order to maintain their healthy teeth), they are very gentle and do not bite. If you're in need of a tiny creature to love, pet and coo over, cuddle and hang out with, the Abyssinian guinea pig is your perfect pet. Just keep in mind that the cage itself is a bit of a pain to clean, but that the animal itself is wonderful.